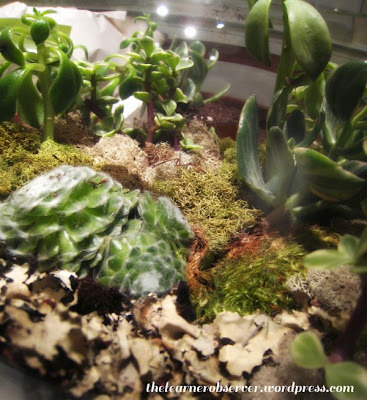 I love this close-up shot of a terrarium interior from thelearnerobserver. It emphasizes all that I love about terraria - the idea of imagining yourself as a tiny observer in your own miniature forest. With that said: use moss alongside succulents with caution! They are not suited for the same environment and if you are aiming to maintain the terrarium environment over time- you will only be able to keep one or the other alive. Actually, there are many species of dryland moss found all over the world that would do just fine growing with succulents and cacti. They are adapted to dry climates with the ability to shrivel up and desiccate entirely, appearing as a rather unnoticeable brown fuzz on the rocks. Although I am not familiar with any of the scientific names (and there are numerous species), my coworkers and I call them all JAW (Just Add Water) mosses because of their ability to unfurl and turn green within seconds of receiving water. They photosynthesize as long as they can maintain that moisture and then go dormant again. They are some of my favorite plants! That being said, the moss in this terrarium does not look much like a JAW moss to me and is probably a bad combo. Thanks for sharing that interesting fact! I look forward to learning more about that type of moss.